Test the latest DJI Inspire 2 firmware and win DJI Credit! New Inspire 2 firmware will be available soon! To optimize user experience of the new version, we would like to invite you to participate in the public beta test. If you give us your feedback, user experience, and valuable suggestions for firmware optimization, you will get a chance to win DJI Credit and exciting accessories! You may also be authorized to join future internal beta tests, win special titles, and even interact directly with DJI R&D engineers. 1. We will give you access to the public beta test after receiving your information. We suggest you to enable DJI Product improvement Project in DJI GO 4 (Me ->Top Right setting button - > Privacy - > DJI Product improvement Project) to help us optimize our products and services. 3. Please fill out the attached form and email it to beta@dji.com with “Inspire 2 Firmware Public Beta Test Feedback” as the subject line. 1. The rewards are based on a point scheme. DJI will review and classify your feedback according to the criteria below, then determine your points according to how much the reported bugs can contribute to firmware optimization. 2. We will calculate points between the release of the beta firmware and the release of the official firmware. After the rewards are given out, points will return to zero. 3. The top 30 point earners will be rewarded with 200 CNY DJI Credits. Top 10 point earners will be rewarded with an Inspire 2 shirt (fixed size) and 200 CNY DJI Credits. Top 5 point earners will be rewarded with an Inspire 2 shirt (fixed size) and 200 CNY DJI Credits, as well as a chance to join the DJI internal test team depending on whether the feedback they provided was constructive. 4. The rewards will be released after the public beta test. If several users report the same bug, they will all receive points; however, the first person who reports the bug will win one extra point. Within the scope of the law, DJI reserves the right of final interpretation of the program. What do I get if beta firmware crashes my drone? I think it can be a good experience! Hi Nicksons, it will come soon, we have attached the release notes in the thread, you can check it. Hi rent, any crash caused by the beta firmware, we will cover it. If all those changes work this could be a solid firmware ! i hope my application gets excepted soon, i have the next 4 days off work and the weather is looking good! 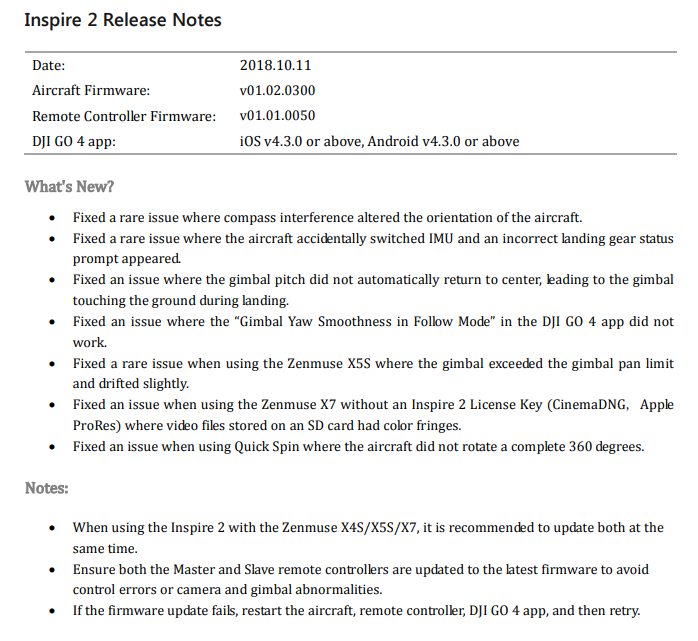 On the latest release of firmware (.200) I was able to create the “Fixed a rare issue where compass interference altered the orientation of the aircraft“ issue nearly 100% of the time and because of that Im keen to test and provide feedback for this. Soon after the .200 firmware was released, I provided my flight logs to DJI showing off this issue, so I’m interested to see if it’s fixed. I have no interest in the DJI credit on offer or a bug bounty, but rather ensuring the issues can/will get fixed, as such I’m hoping my feedback and/or logs will do that. It will come very soon, please wait patiently, thank you. Hi Mafia, as I mentioned, any crash caused by the beta firmware will be covered, no worries, welcome to test the beta. Hi Flo, currently, DJI Force Pro is only compatible with the Ronin 2 and Ronin-S, or third-party gimbals through an S-BUS connection. Your need will be forwarded to our engineers for consideration. Hi jdmagoo, thank you for your participation, hope the issue you are experiencing now will be fixed with this firmware. Hi massimiliano, it should work now, please try again, if not, please check my screenshot below. Hi flyingfun, please check the screenshot in 20# if it still doesn&apos;t work. I put three sets of Batteries through today and tested for a good hour trying to replicate the problem and can say it’s fixed!! Previously I could get the inspire to yaw uncommanded nearly 100% of the time, now not once! You may want to check the terms of the beta, often they have a clause in there that prohibits you from sharing updates outside the program. As much as I would love to hear about this program I don&apos;t want you (or anyone) to have issues with the program terms (if those exist within this DJI Beta). However, your post contains very exciting news! I was going to sign up for the beta but didn&apos;t think I would the weather to fly much as winter and snow is all around me now. Finally good news! No warning messages? No horizon tilt? No drifting? Stable ? It’s really working? POINTS, POINTS, AND MORE POINTS!! YOU MAY EVEN GET A DJI SHIRT!! FIXED SIZE OF COURSE!! OHHH!! It will be an experience All Right !! Mindy, who determines that ? You people are out of your minds! If you want test pilots, pick the experienced pilots and you supply the equipment that you want tested. Why should we invest $ 6-10 K to your developement and or update programs? I paid good money for something that was advertised as FLAWLESS!! Now you want me to help you for a T-Shirt at my expense and time ! Recruiot some experienced users and work with them directly to help you with field experience and supply the input. while you are right it seems that the first reports about the beta seem to be very positive and let´s hope it will get use a great .300 firmware soon and the nightmare is over ! Thanks for the warning, I did check before posting. Couldn’t see any reference to terms and conditions anywhere so figured it’s fair game. Same as Apples public beta. If it’s an internal beta that would be a different story, in addition there was no NDA for me to sign as well. I’m not really sure how a public beta is any different to installing the release version in the past. Previously DJI would internally test the firmware until its at a satisfactory level, then release to the public as a finalised version. Then the bugs come out. This time round they did the same testing internally until it’s at a satisfactory level, but unlike previous, they opened it up to a small public sample group to capture any further bugs. For me this is how they should release all future firmware, but also, I couldn’t use the .200 firmware as the uncommanded yaw drift occurred to often and I considered it unsafe. So installing let’s me see if they fixed that and provide aircraft specific feedback if they haven’t. I hope it is positive! 2.0 was supposed to be! Obviously it was never tested in the field. Most people had very bad experiences with 2.0. DJI needs to have dedicated users working with these updates, and not just for points and a T-Shirt! My reward is to have the bAircraft perform as advertised. Mine, I had to put down in tall grass ever so gently in order not to damage the Gimbal. The landing gear would not come down. Fortunately the only damage was grass stains from mowing then landing spots weeds. Went back to the 100 version and things are OK other than the stable hover issue. With the 200 there is also a very slow response issue while turning. Submitted, glad if we&apos;re accepted.